When a Solo gets subjected to any of these effects, simply downgrade it by one step. So a power that makes its target stunned would only daze a Solo. This is the core, reasonably safe option. It should solve most of the Solo problems, significantly reducing their need to rely on exception-based status effect avoidance. As you probably noticed, I’ve also included nastier steps in the effect sequences. They’re there for those brave enough to experiment. If Solos are a tier above the PCs, Elites are on the same tier as them and Standard monsters are a tier below, why not make status effects hit Standard monsters harder? Well, its obvious why not: standard monsters are called that for a reason, as they’re the ones the characters face most often, and all of their powers are measured against them. So this is only to be attempted with extreme caution, and will affect your encounter composition and dynamics. Still, it gives your players a chance to enjoy powerful effects even at low character levels, without you having to worry they will wreck your important creatures. An unrelated bonus. For those rare situations when you want your epic heroes to face off against a mundane threat – a threat so lowly, it’s not even minions to them. A minion mob. Made up of 5-10 mundane tier enemies. This stat block is from our 4eLite test game, in which epic level 10 fey kings were fighting off an invasion of a fomorian despot. 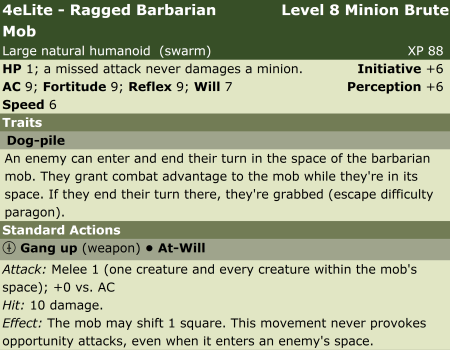 Should you so wish, it’s trivial to convert the stat block back to regular 4e (making them level 20+), or just use the idea for your own monsters.